2. Choose a square with the same number as the dice. 3. Read the Roman numeral, and if correct, place a colored counter on the square. 4. The winner is the player who achieves 4 counters in a row vertically, horizontally or diagonally. – This game works best as a two player game. – Can be played without a die – children just choose numeral. 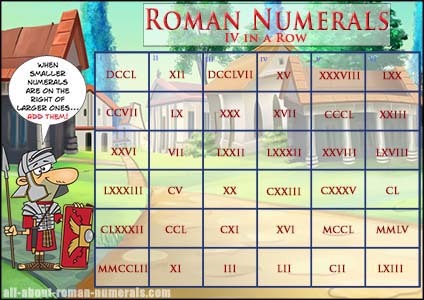 – Try playing best of three plays – this helps to reinforce roman numerals. – 1 PowerPoint Version for easy game introduction and discussion. – To print and laminate the board. – Print and laminate the reference cards. – Small colored counters for each player e.g. Player 1 = red & Player 2 = green.